All summer long, I’ve been meaning to show you guys what our flower baskets on wooden posts looked like this year. Every time I would water them, I would think that I needed to take some photos. But by the time I got everything watered, I would be so hot that I just couldn’t go back outdoors with the camera. But we had a little rain recently and that cooled things off considerably, so I was able to take some photos early this morning. It was over two years ago when I first posted about How to Mount Flower Baskets onto Wooden Posts, but these posts have actually been up in front of my mother’s apartment for five years now. All I do is replace the liner and the plants each year. 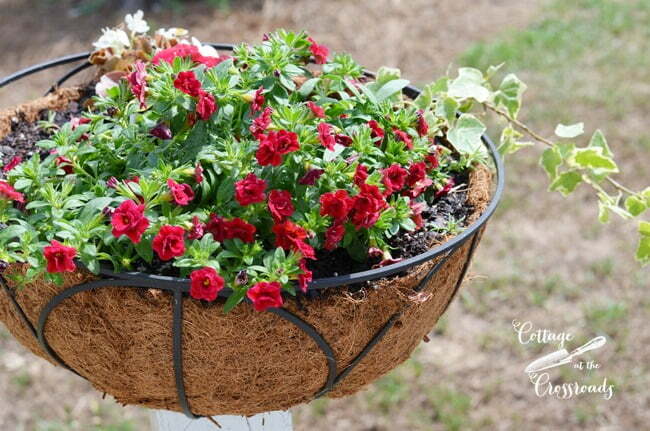 After this past long and cold winter, this is what the baskets looked like. You can see that some plants survived. 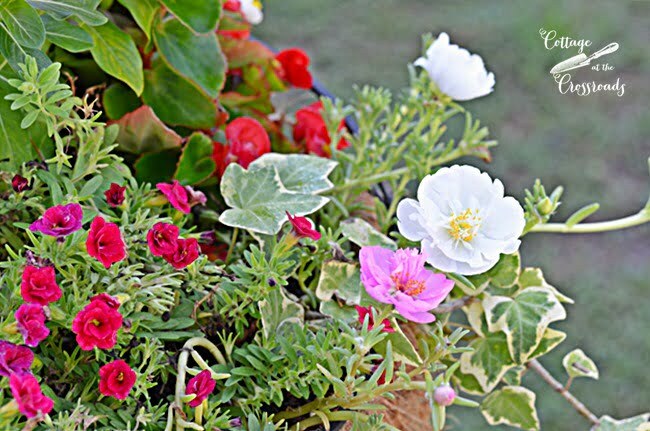 So in early June, I purchased some annuals and some fresh liners for the baskets. 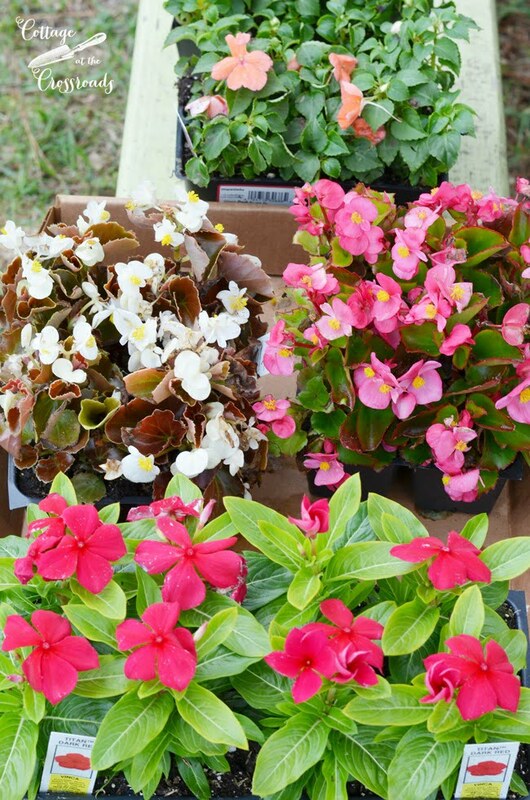 I had never tried vinca, the red plants, in the baskets before this year, but I think I’ll be putting those in from now on. 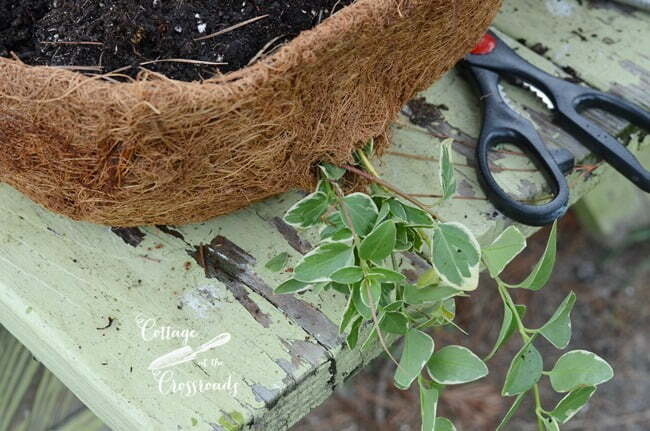 You may remember from the original post how I cut some holes in the sides of the liners and pull the trailing plants through the holes. This is some periwinkle that survived the winter, too, so I saved it as well. 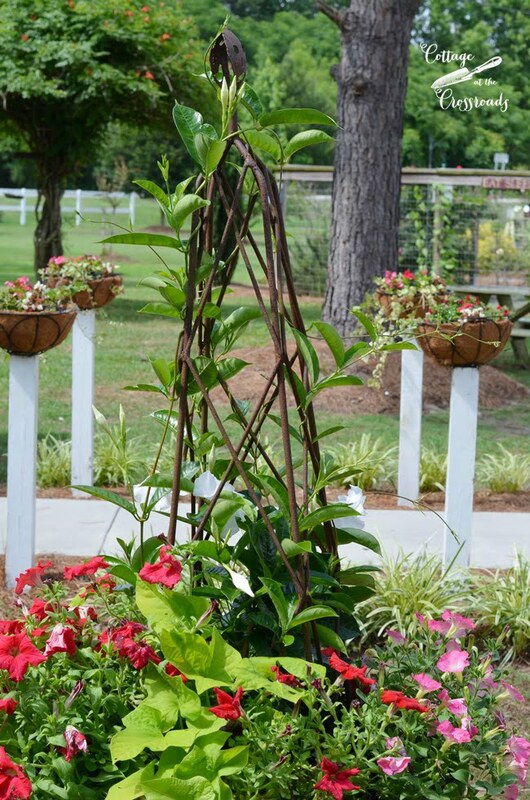 Here is one of the baskets when it was newly planted. This one has a red “million bells” plant in it that has been gorgeous all summer. 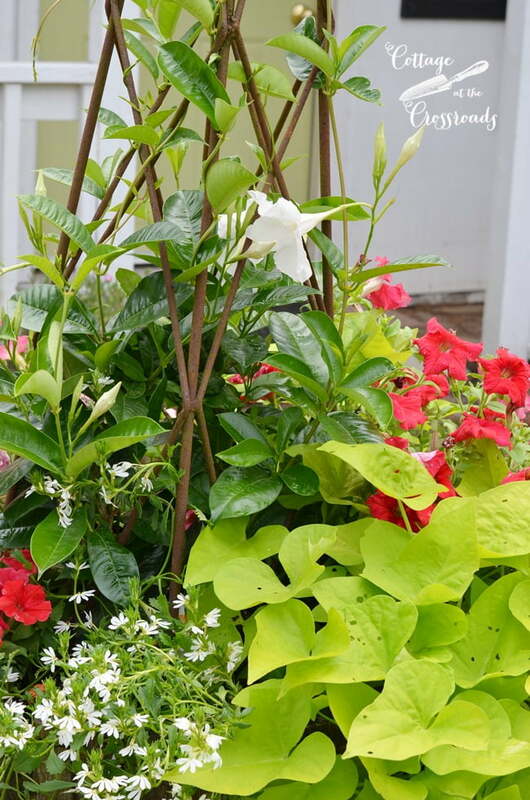 The wooden barrel that is nearby got planted up with red, pink, and white flowers. This is what the flowers in the barrel looked like about a month ago. But now the sweet potato vine has grown so much that it has covered all the other plants. 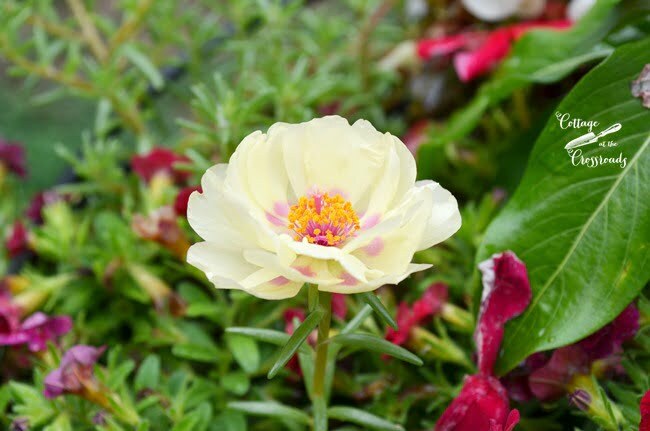 Remember the little sprouts of portulaca that I saved? They grew and have bloomed all summer. This color has been my favorite! Remember how tiny the red vinca plants were in June? Well, they have shot up nice and tall and have served as the “thriller” in the baskets. See? I will definitely use them again in the baskets next year. 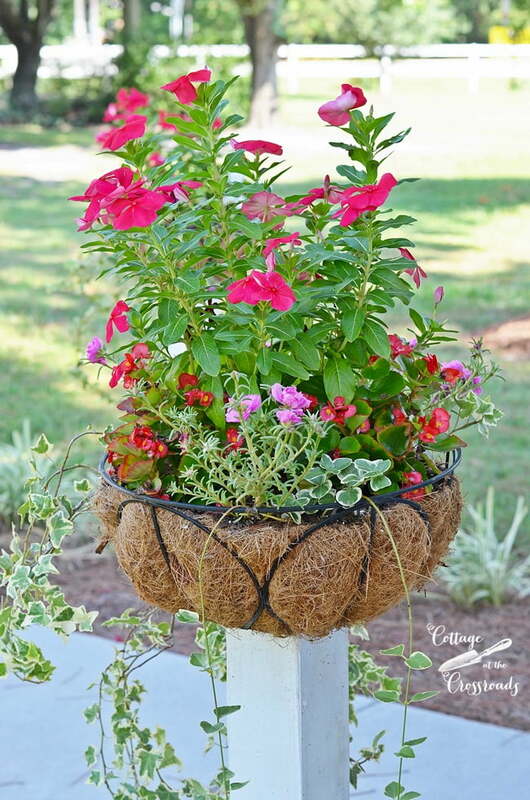 Even after 5 years, I still love the flower baskets mounted on wooden posts. See that wall of green behind them? Well, that’s the subject of a whole ‘nother blog post! That looks so pretty and your flowers are gorgeous! I’m always looking for smart idaes to beautify my yard! 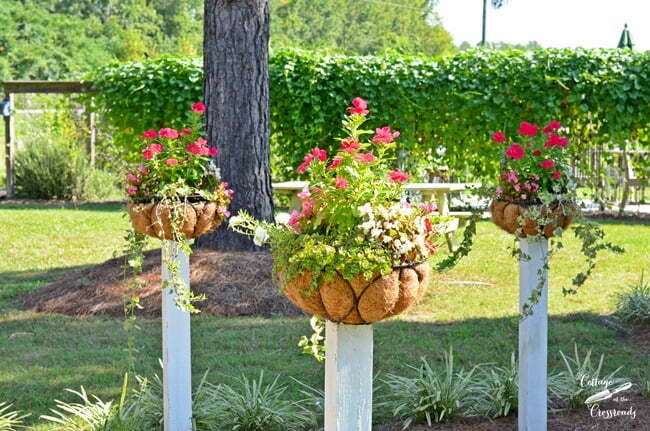 What a wonderful way to welcome guests to your home, sentinel flower baskets. Gorgeous, makes me jealous of how long you get to enjoy them down South. N.Illinois here and we didn’t have any summer until after June 15th. I have two huge vintage porch posts, I may just cut apart and try this next year. Thanks for the idea. Hi, Jane! Visiting you from Wow Us Wednesdays. I just love this idea and think it’s so pretty! Your containers are all gorgeous! 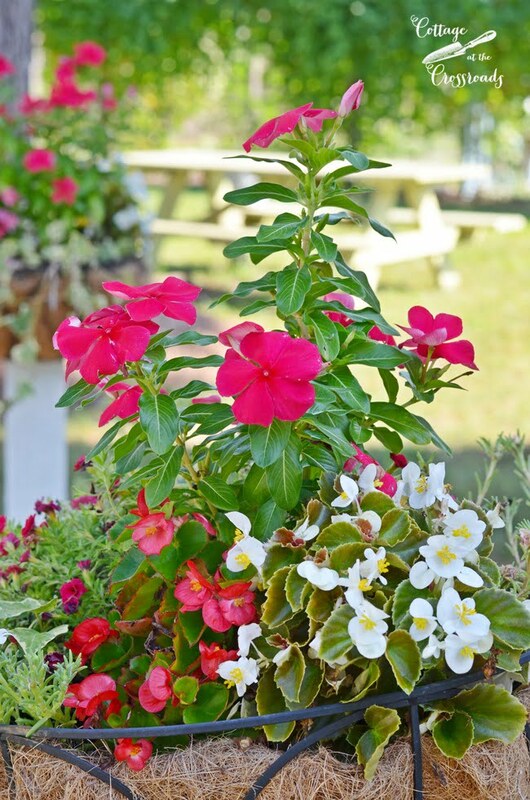 Love your flower baskets! Great photos! I love how that looks! So summery and cottagey and fresh! I wish I had a picket fence to do that with! 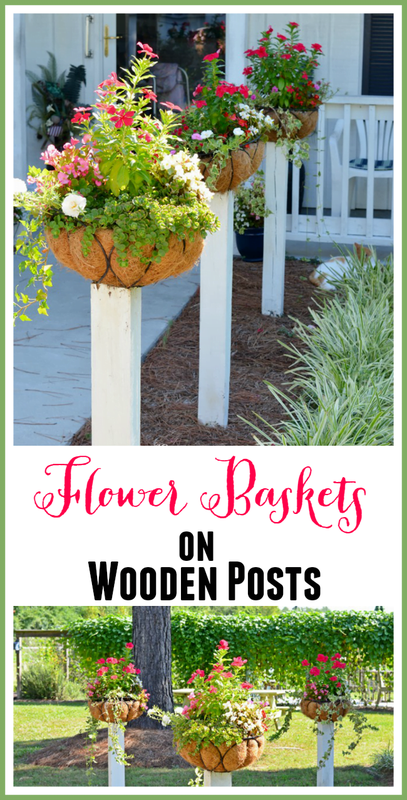 I so love those flower baskets…so remember loving them when you first blogged about them….your garden is amazing…so beautiful…and are those grape vines? I really like this idea, because flowers make me smile 🙂 However, with the deer problem we have here, it would just be another delicacy for them. They are eating more than normal this summer, and it makes me sad 🙁 Jane, I get so much JOY from reading all you & Leo get done. They are gorgeous, I love those “free volunteers” too. 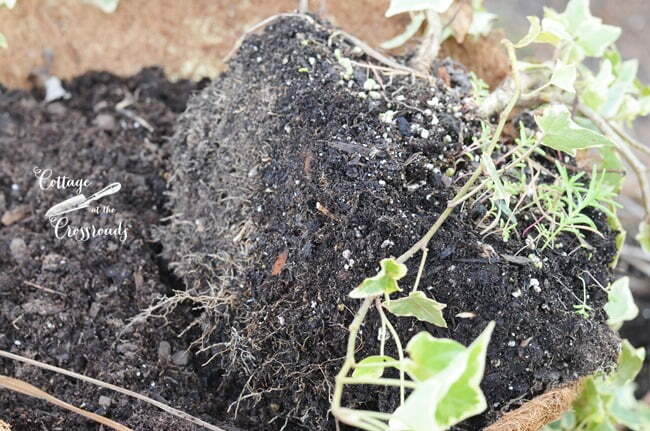 I leave many of my flower boxes to overwinter without disturbing them and get many seeds popping up come Spring. This is such a clever idea. I need someone to come dig some holes for me now. I’d love it if you shared this at What’d You Do This Weekend over at Tumbleweed Contessa. Beautiful baskets. Love how you were able to reuse some plants. 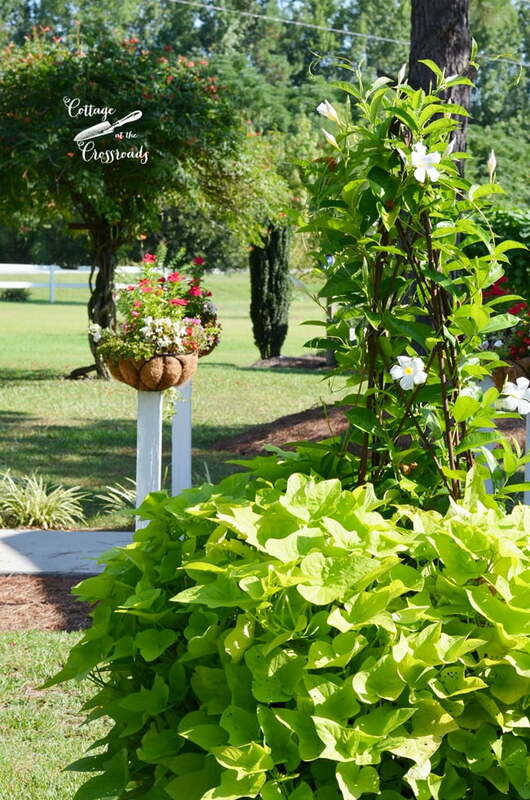 Beautiful baskets and that wall of green looks eerily like my wall of morning glories that have yet to bloom! Oh wow, I’m gonna have to try this! I’m getting to the point where I can’t bend over to take care of my flowers (bad back)so this being on top of posts where I don’t have to bend….brilliant! So pretty too, thanks very much for the idea! 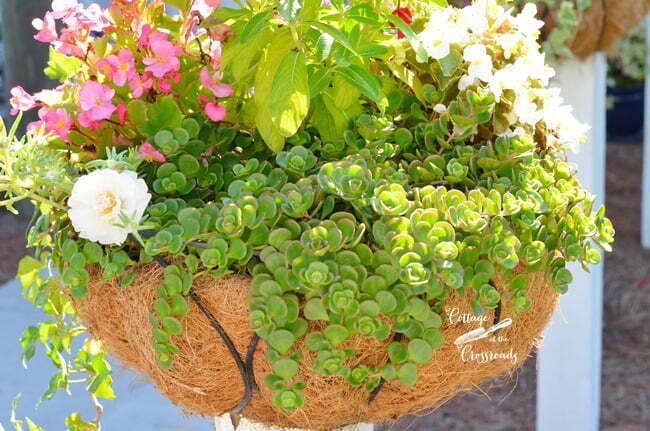 Hi Jane, just love the posts and pots and all your photos are wonderful! Thanks! 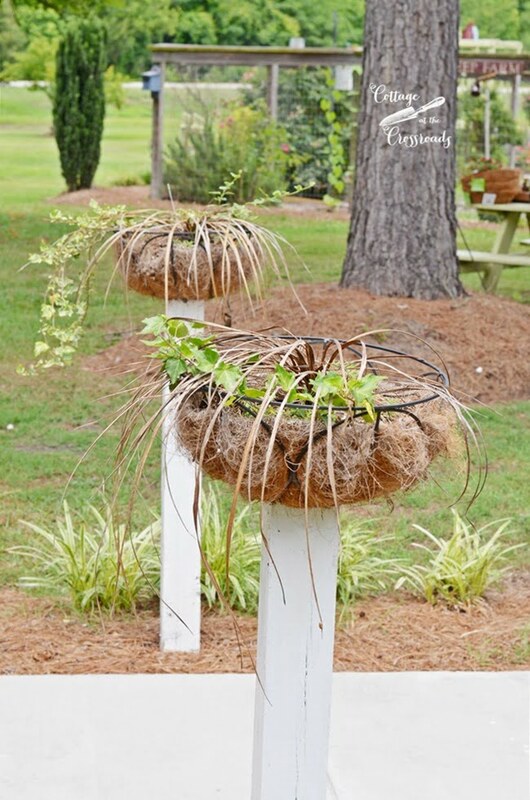 Jane, I love ideas to add vertical interest in the garden so I love these planters! All of the flowers look awesome! Jane this is so cute and clever. Very nice. Hi Jane, love, love, all the gorgeous color in your baskets and the barrels. They are so brilliant looking, it’s great to be able to use the baskets year after year plus salvage some of the vines. Great job!